Natuzzi Tobia B993 simplicity is a keynote to fabulous design. Some lovely clean and in interacted minimal style which the Tobia B993 delivers, with a twist of vintage includes giving subliminal momentary back in time 5 to 6 decades ambience of the atomic age. This innocent vision of the future gave influences for design inspiration for decades to come. Natuzzi One of the worlds foremost designers in the industry have sprinkled a bit of atomic age magic dust on this design classic the B993 Tobia. THE NATUZZI EDITIONS MODEL NO B875 ITALIAN CRAFTSMAN LEATHER SOFA IS STYLED TO BE NOTICED. A DESIGN THAT’S RETRO ITS AND STANDS OUT. THE NATUZZI EDITIONS MODEL NO B993 TOBIA IS TRULY AN ITALIAN CRAFTSMAN LEATHER SOFA AND AVAILABLE WITH METAL LEGS OR WALNUT FINISH. LOTS OF CURVES ARE PRESENT ON THIS SOFA. ITS VERY UNIQUE AND HAS GREAT OVERALL LOOK. 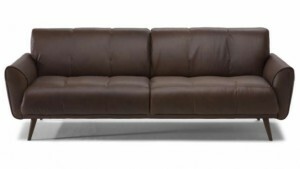 TOBIA B993 IS VERY VERSATILE AVAILABLE IN LEATHER OR FABRIC WITH OR WITHOUT CONTRAST STITCH ITS YOUR CHOICE.